Use a pozidriv #2 screwdriver for all hinge adjustments. These simple adjustments are not a part of our warranty. the adjustment screw operates in conjunction with the inner leaf of the hinge arm. The door moves in only one direction – parallel to carcase and without a gap developing between the door and carcass. No further adjustments are necessary. height adjustment is made without loosening any screws. The door can be moved vertically by ±2mm simply by rotating the cam adjuster in this range of mounting plates. the adjustment screw operates in conjunction with the inner leaf of the hinge arm. The door moves in only one plane – parallel to the carcass and without a gap developing between the door and the carcass. No further adjustments are necessary. The Silentia+ is equipped with an innovative switch to delay the decelerating action. With the switch toggled to the “+” side, the soft close will start at 30°. With the switch toggled to the “-” side, the soft close will start at 10°. 1. To reveal the side to side and up & down reveals on drawer faces begin with the removal of the drawer pull or knob. 2. 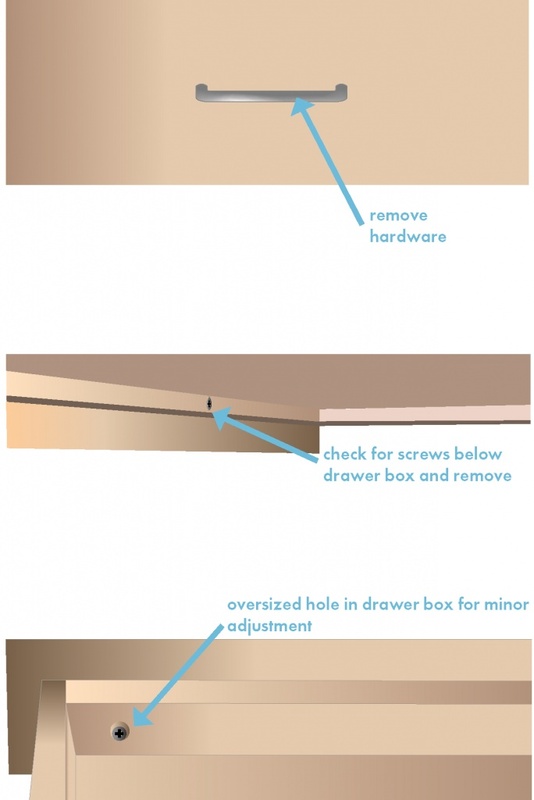 Next ensure that there are no screws below the drawer box into the face. If screws are present – remove them. 3. This should leave 2 remaining screws holding the drawer face in place. These two screws have a slightly oversized hole in the drawer box to allow some adjustment. Loosen these two screws in the drawer box and physically adjust the drawer face. Tighten screws when you are satisfied with location.